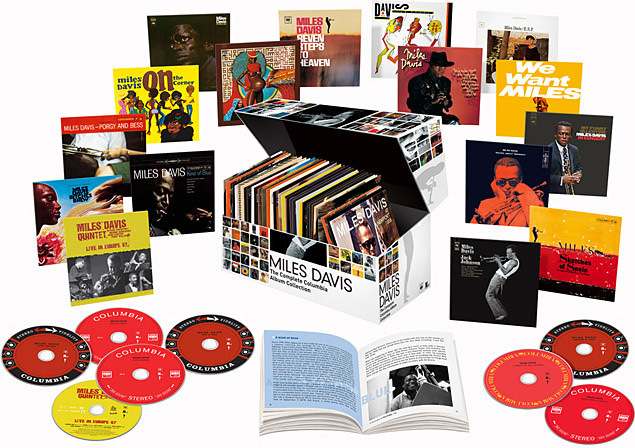 Unpack This: 70 CDs Of Miles Davis Just in time for the holidays comes a backbreaking load for St. Nick — all of trumpeter Miles Davis' Columbia recordings in a single, 70-CD collection. Along with a DVD of a 1967 live performance, there's enough music here to keep a listener busy right into the new year. 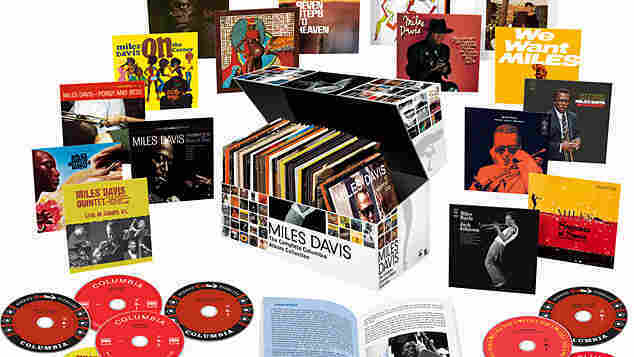 The Complete Miles Davis Columbia Album Collection includes 70 CDs, a DVD and loads of unreleased content. Just in time for the holidays comes a backbreaking load for St. Nick: all of trumpeter Miles Davis' Columbia recordings in a single, 70-CD collection. Along with a DVD of a 1967 live performance, there's enough music to keep listeners busy right into the new year and beyond. Trudging through the behemoth collection of Davis' music in the past few weeks was a bit like the jazz equivalent of the Death March of Bataan — albeit a cooler, far more swinging journey. Recorded between 1955 and '85, it bears witness to his perpetual restlessness and growth as a musician and bandleader. These digitally remastered recordings range from the lyrical (if sonically inferior) Paris Jazz Festival date to the extended funk-rock jams of his twilight years on We Want Miles. In the beginning, it was Davis the bebopper who burst on the scene, stringing rat-a-tat fusillades over furious tempos, a style he picked up from saxophonist and band mate Charlie Parker. Unfortunately, he also mimicked Parker's offstage lifestyle of sensual excess, which took its toll on the trumpeter's health in his twilight years. But Davis' precarious lifestyle was also part of his allure. He was at once contemptuous of his audience and eager to win its approval. Both Jack Kerouac and Jean-Paul Sartre revered him as the ultimate outsider, a detachment you can feel palpably in one of his ice-cool mid-'60s tunes, the Wayne Shorter-penned composition, "Nefertiti." But as diffident and antisocial as he could appear onstage — sometimes turning his back to the audience while soloing — Davis revealed his sensitivity by playing serenely measured ballads in the middle register of the trumpet, often with a Harmon mute in the bell, as on "Someday My Prince Will Come." The frosting on this 70-layer musical cake is the inclusion of Kind of Blue, for which Davis recruited pianist Bill Evans and saxophonists John Coltrane and Cannonball Adderley to make what many critics agree was his finest hour. I like to think of the album as the most accomplished chamber music of its day: not just the best jazz, a term that Davis regarded as insulting and nearly racist. In his own words, "I was always just trying to hear something new." In an earlier version of this story the reviewer stated that the song "Nefertiti" was written by Miles Davis. It was actually composed by Wayne Shorter.